Horsehair can come from anywhere, but is mostly imported from Mongolia, Siberia and Canada. The hair we use, as far as I know, comes from dead horses. At least that is what I saw in a film over Mongolia. Usually it’s shipped to China where the hair gets selected, which is a lot of work. The hair is washed and often bleached to give it an evenly white color. Unfortunately, this is not good for the quality because it makes the hair more brittle, as you can imagine. 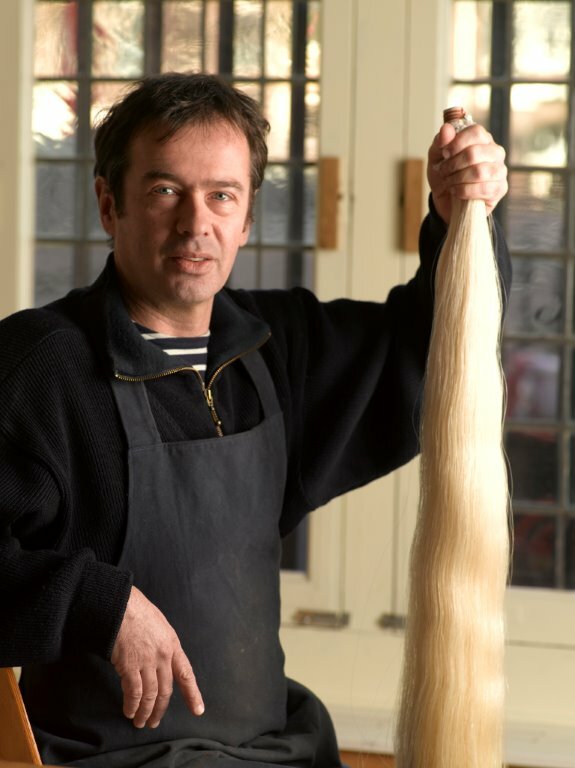 Horsehair is basically the same as our hair, just thicker and longer. Black hair is a little thicker than white hair, but the difference lies only in the pigment. Again, this is the same as with human hair. Very long hair is better. Because the horses wave their tails the whole time to chase away the flies, it makes the ends of the hair very thin and brittle. If the hair is long, we can cut off the ends. The longer the hair, the more expensive it gets. Merries urinate on their tails and that spoils the quality of the hair. So, the more expensive hair, they always say, comes from the tail of white male horses. In fact, I have no control over where the hair comes from originally and what they have done with it before I buy it. It is not easy to find good hair: completely unbleached, even and strong. But the quality of the hair is not the only thing that counts. To do a good rehair, one has to be experienced in choosing the right amount and the right length and getting an even tension. A soft and light bow needs less hair than a stiff and heavy one. A violin bow needs a little more tension on the right side, while a cello bow needs more on the left side. Coming back to the properties of horsehair: Each hair is made of keratin and is harder inside and has a softer layer on the outside. The outer layer is electrostatic and a little irregular. The rosin sticks to the hair due to the static electricity and the irregular surface. This is proven by Prof. Jan James in Amsterdam. He describes this in his book, Practical Acoustics of Instruments of the Violin Family, published by Henry Strobel. Rosin is actually the residue which remains after turpentine is made from the sap of resinous trees. Most of the etheric oils have been evaporated and what is left is a hard and fairly dry rosin. When I worked at Salchow in NY, we used to buy big bags of rosin from Greece. We heated it up to about 80 degrees and just before it begins to boil, poured it into rubber forms. That was it. The darker rosin is boiled a little longer and has, therefore, lost more of its volatile oils. Dark rosin is a little more powdery, but I couldn’t say if it is stickier than the yellow ones. Some rosin makers add softening substances to bass rosin. What most musicians don’t know is that rosin oxidizes with time. Oxidized rosin has much larger molecules which don’t stick to the hair as well. If you haven’t played a bow for a while it often doesn’t work as well as you were used to. Oxidized rosin is one of the main reasons for that. Also your piece of rosin, also, gets oxidized over the years. Since more than 1000 years stringed instruments have been played with a bow, which is basically a stick with hair on tension and rosin. The interaction between the string and the rosin on the hair is a very complicated phenomena. Strangely enough, there is very little research on this matter. Prof. Jim Woodhouse in Cambridge and Norman Pickering in the States did some. Most of it, I must admit, I don’t really understand. Therefore, I try to find explanations from my own experience. When I rehair a bow I use rosin to glue the hair together at the tip and the frog. First I make a knot and then I heat it together with a piece of rosin. The rosin becomes fluid and even boils into the knot. Hot rosin is extremely thin and fluid, just like superglue. It goes in between the hair ends and glues them together. The knot becomes as hard as stone! That tells me some things about the properties of rosin. It heats up very quickly and when it is warm it becomes fluid. In the fluid form it is less sticky and when it cools it becomes sticky, again. That seems obvious, but it’s hard to measure stickiness or adherence. Chemically it is quite complicated to explain why glue holds things together. I think it has to do with electrostatics, but this is obviously not my field. The viscosity of rosin is important, because the bow has to get the string in movement, and then let it vibrate as freely as possible. That is a paradox. The string and the bow hair are in continuous contact with each other. The movement of a string is very complicated. It oscillates up and down, to the left and right, and, on top of that, in a circular way. The point of contact changes continuously. Obviously there is friction at the contact point. This friction heats the rosin up, which has been photographed with infrared. (I have seen the picture, but don’t remember where it was.) Anyway, it is easy to believe that friction produces heat. Rosin has the characteristic that it reacts extremely fast to heat. This property is the key to understanding why rosin makes a string move and then let it go. The faster you move the bow on the string the louder your tone becomes. This is because the oscillation of the string is bigger. You should use just enough pressure to keep the bow hair in contact with the string. If you use more pressure than necessary, the dampening effect becomes stronger and the sound becomes dirty and distorted. A clean sound travels much better in a hall, even though the volume might be a little less. That is the explanation why a soft and light bow can make a bigger sound than a stiff and heavier one. If you use more bow speed and just enough pressure, but not too much, you use the miraculous properties of the rosin in the best way. Subscribe for free and have my posts delivered to your inbox.